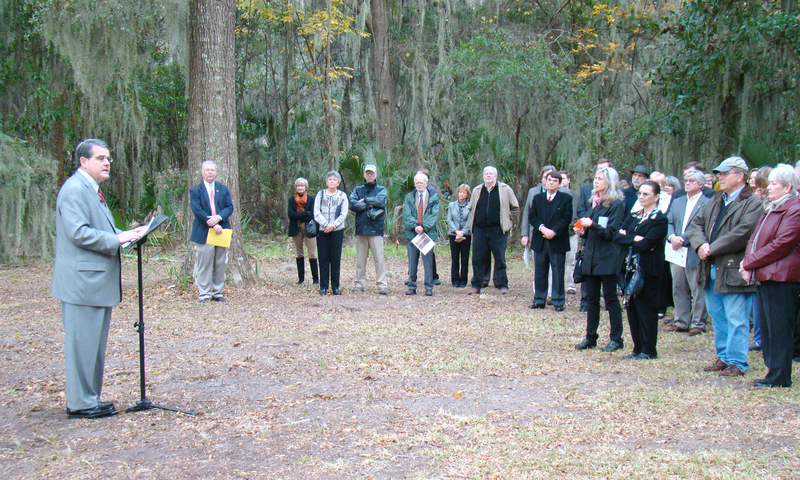 UGA President Jere Morehead addresses the crowd at the Wormsloe groundbreaking Dec. 2. Savannah, Ga. – A groundbreaking ceremony and reception were held Dec. 2 for a new research cabin at the University of Georgia Center for Research and Education at Wormsloe in Savannah. The facility will house UGA faculty, Wormsloe Fellows and other graduate students while they conduct research at the site. Attending the ceremony were UGA President Jere Morehead; Tom Landrum, vice president for development and alumni relations; Craig Barrow, whose family has lived on the property for nine generations; Sarah Ross, director of the Wormsloe Institute for Environmental History; Daniel Nadenicek, dean of the College of Environment and Design; and Charles B. Knapp, interim dean of the Terry College of Business. Many other Wormsloe Foundation trustees and student representatives also attended the event. In April 2013, the Board of Regents of the University System of Georgia voted to accept a gift of 15.45 acres of Wormsloe property, located 10 miles southeast of Savannah, to the University of Georgia. The trustees of the Wormsloe Foundation donated the property to the state of Georgia for environmental history research and education. The intention is for the property to be used for interdisciplinary research by faculty and graduate students working in archaeology, ecology, environmental planning and design, historic preservation, landscape architecture, geography, history and engineering. Located on the Isle of Hope, Wormsloe Plantation dates back to the 1730s, and the property has served as a military stronghold, plantation, country residence, farm and tourist attraction. UGA will operate the donated portion of the property as a historical and ecological preserve for scientific, historical, educational and aesthetic purposes in keeping with the natural and historic character of the property. The donated parcel contains both highland and marshland and includes a historic former slave cabin. UGA’s Cultural Landscape Laboratory in the College of Environment and Design began an in-depth study of the cultural landscape at Wormsloe Plantation in 2010. Currently, CED faculty and graduate students are conducting a comprehensive inventory of cultural landscape features at Wormsloe. Working with the UGA department of geography’s Center for Geospatial Research, researchers are building the inventory as a computer-based Geographic Information System. The lab’s Wormsloe project also includes collecting oral histories from members of the greater Wormsloe community. The environmental history research is managed in partnership with the Georgia Department of Natural Resources and with support from the Wormsloe Foundation. In addition to expertise on the UGA campus in Athens, the Center for Research and Education at Wormsloe coordinates research projects with the Wormsloe State Historic Site and UGA units such as the Skidaway Institute of Oceanography, Marine Extension Service and Sapelo Island Marine Institute as well as Savannah State University, Georgia Southern University and Armstrong Atlantic State University. “Collectively, these research initiatives will contribute to the larger bank of knowledge and enhance opportunities to protect the cultural and natural resources of Georgia’s coastal regions,” said Ross. The College of Environment and Design is home to one of the oldest and largest schools of landscape architecture in the U.S. and offers degrees in landscape architecture, historic preservation and environmental planning and design, as well as a certificate in environmental ethics. For more information on the College’s Cultural Landscape Laboratory and partners, see www.ced.uga.edu/cll.